Are you able to help your clients discover the true, the good, and the possible about improving their wellbeing in ways that fuel their confidence, energy, and commitment to the changes they want to make? Can you help them to consistently flourish as they navigate the highs and lows we all experience? 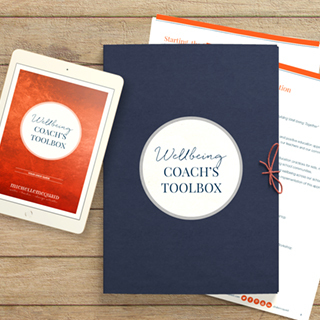 Based on the exact coaching model I use with my clients the Wellbeing Coach’s Toolbox gives you everything you need to give people the knowledge, tools and support they need to create lasting changes in their wellbeing. This digital toolkit contains everything taught to me by Professors David Cooperrider and Martin Seligman and fuses an appreciative coaching approach with the PERMA framework and my favorite positive psychology tools including the VIA Survey, Best Future Possible Self, Hope Maps and Habits. It’s my heartfelt hope you’ll steal these materials with pride to help others. A 30 minute training video detailing the appreciative coaching and PERMA frameworks I use with my clients, and why these steps are so effective in working with people’s brains to create lasting change. A step-by-step ebook with examples of the appreciative coaching questions I use to bring PERMA to life, cautions for using positive psychology approaches and guidance on who these tools are most suited for. Done-for-you playsheets to download and print that draw on my favorite positive psychology tools (the VIA Survey, Best Future Possible Self, Hope Maps and Habits) that you can steal with pride and use with your clients to guide them through the appreciative coaching process. *This is a digital product. You will receive an email and access to the materials in the membership area.